On May 16, Crate.io announced the availability of CrateDB 2.0, an open source SQL database that specializes in IoT and machine data. The innovation of CrateDB consists in leveraging SQL to aggregate and perform real-time analytics on IoT and machine data instead of the NoSQL databases commonly used in the industry for related use cases. CrateDB’s ability to accommodate the ingestion of high velocity streams of data and to perform queries on rapidly changing datasets, with impressive levels of scalability and latency, allows developers to combine their familiarity with SQL alongside a solution specially designed for the unique needs of IoT and machine data applications. CrateDB 2.0 features clustering upgrades that deliver improved query performance by means of faster aggregations and new index structures. In addition, CrateDB 2.0 contains a bevy of SQL enhancements that give developers a greater range of options regarding joins, sub-selects and the renaming and re-indexing of tables. The Enterprise Edition of CrateDB 2.0 offers performance monitoring, enhanced security as well as the ability for end users to create user-defined functions. CrateDB 2.0’s clustering upgrades, SQL enhancements and enterprise-grade security and performance monitoring mark a new milestone in the platform’s evolution that testifies to its readiness to embrace enterprise-grade workloads that include sensor data, GPS data and the industrial internet more generally. Subsequent to news of its general availability in December 2016, Crate.io’s release of open source and enterprise-grade versions of CrateDB underscores the early traction the platform has received, with over 1.3 million downloads and 50 customers using Crate.io in production. With the IoT and machine data space gearing up for a rampant proliferation of devices and corresponding datasets in forthcoming years, expect Crate.io to continue building on its recent momentum, particularly as organizations look for scalable databases that allow organizations to leverage widely available skillsets in SQL. GE Digital (GE) has acquired ServiceMax for $915M as part of its broader vision to build out its capabilities for delivering services for the industrial internet. ServiceMax focuses on digitizing the delivery of services to ensure the health of devices used in verticals that include life sciences and medical management, aerospace and defense, energy and utilities and building services. For example, ServiceMax optimizes the service lifecycle for the repair of devices such as elevators and oil rigs by giving field service engineers a platform for understanding, identifying and responding to issues related to devices. The ServiceMax platform manages workflows such as the discovery of installed devices, scheduling of device maintenance, documentation of issue resolution, the delivery of proactive alerts regarding device maintenance and the delivery of updates to customers. ServiceMax’s digitization of field services via a SaaS platform also handles inventory management, parts and returns management as well as contract and warranty management. GE’s acquisition of ServiceMax positions it to continue leveraging and enhancing its Predix platform for aggregating and analyzing massive volumes of machine data from the internet of things. Built on Cloud Foundry, the Predix Platform as a Service provides a framework for connecting machines and then subsequently writing applications that deliver analytics and business intelligence about the performance of the ecosystem of connected devices. By acquiring ServiceMax, GE differentiates itself as the undisputed market leader in analytics and professional services for the internet of things and stands poised to drive a tighter integration between the Predix and ServiceMax platforms. The parallel value streams implicit in GE’s Predix cloud for facilitating app development for IoT and the digitization of field services specific to ServiceMax promise to synergistically inform each other and consolidate GE’s leadership in all things related to the industrial internet. ServiceMax was founded by Athani Krishna and Hari Subramanian. The company had raised a total of $204M prior to its acquisition. Multinational engineering and electronics company Robert Bosch GmbH recently detailed plans to launch its own cloud computing platform to aggregate and analyze data from machines and appliances such as automobiles, dishwashers, washing machines and power tools. Based in Germany, Bosch’s Internet of Things cloud computing network boasts connections to over five million devices. The German industrial giant plans to run 50 of its own proprietary applications in the Bosch IoT cloud before opening up its infrastructure to applications designed by third parties. The Bosch IoT cloud aims to compete with analogous services from the likes of cloud vendors such as Amazon Web Services, Microsoft, Google and IBM. Bosch’s Internet of Things cloud will initially run out of Germany but the company has plans to open IoT datacenters all over the world. The company hopes that basing its initial operations in Germany will attract customers concerned about data security within the U.S.
Microsoft CEO Satya Nadella recently announced the Azure Internet of Things Suite at Microsoft Convergence 2015 in Atlanta. The Azure IoT suite provides the capability to connect with devices and other things alongside the ability to acquire, analyze and visualize data generated from internet-of-things related devices. In addition to the ability to aggregate and analyze IoT data, the Azure IoT suite aims to deliver “finished applications” for use cases such as “remote monitoring, asset management, and predictive maintenance.” Azure IoT features Windows 10 for the Internet of Things as well as Azure Stream Analytics, a preview offering that offers the ability to ingest and analyze massive amounts of streaming data. The Azure IoT suite builds upon the Azure Intelligent Systems Service that Microsoft introduced in April 2014 to make “it easier for enterprises to securely connect, manage, capture and transform machine-generated data from Line of Business (LoB) assets, such as industry devices and sensors, regardless of OS platform.” Azure IoT represents the next step in the evolution of the Azure Intelligent Systems Service that elicited “overwhelming” demand from customers to the point where Microsoft decided to increase the quota of participants who had access to the preview release of the product. Specific details of the Azure IoT suite remain scant, at this stage, but we should expect Microsoft to release a more detailed elaboration of its integrated internet of things platform in the weeks to come. 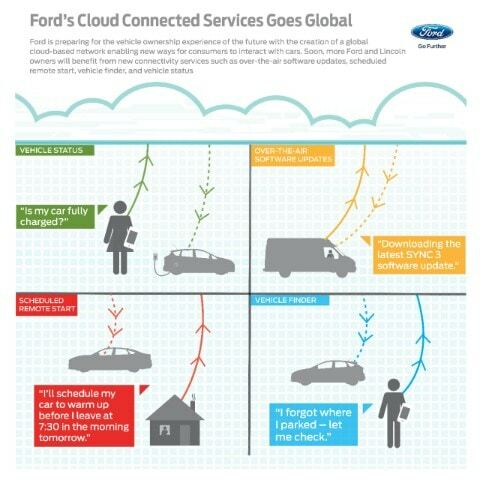 Despite Ford’s readiness to use long-time technology partner Microsoft for the purpose of leveraging a public cloud, the Dearborn-based automobile giant prefers to use on-premise infrastructures for more sensitive data such as odometer readings, engine-related system data and performance metrics that reveal details about the operation of the vehicle. Moreover, part of the reason Ford chose Microsoft was because of its willingness to support a hybrid cloud infrastructure marked by an integration between an on premise data center environment and a public cloud such as Azure. As reported in InformationWeek, Microsoft will also help Ford with the processing and analysis of data given the massive amounts of data that stand to be collected for its fleet of electric and non-electric vehicles. Ford’s Fusion electric vehicle, for example, creates 25 GB of data per hour and subsequently requires the application of pre-processing and filtering procedures to reduce the amount of data to a point that renders its aggregation manageable for reporting and analytics purposes. Ford’s larger decision to partner with Azure represents a growing industry trend within the automobile industry to use cloud-based technology to push software updates to vehicles and gather data for compliance and product development reasons that includes the likes of Hyundai and Tesla. The key challenge for Ford, and the automobile industry at large, of course, will hinge on its ability to acquire internet of things-related automobile data and subsequently perform real-time analytics to reduce recalls, fatalities and facilitate more profound enhancements in engineering-related research and development. Details of which Ford vehicles stand to benefit from Azure-powered software delivery this summer have yet to be disclosed. Benjamin Black, one of the key resources behind the concept and implementation of Amazon Web Services, joined Pivotal Cloud Foundry as Senior Director of Technology in late February. Black collaborated with Chris Pinkham to write the proposal to build Amazon’s Elastic Cloud Compute (EC2) platform that was subsequently approved by Amazon CEO Jeff Bezos. In his new role at Pivotal Cloud Foundry, Black will lead an Internet of Things lab in Seattle that represents the cusp of Pivotal’s thought leadership about IoT data aggregation and analytics. After leading an engineering team at Amazon Web Services, Black worked at Microsoft before becoming CEO and Founder of Boundary. Black’s addition to the Pivotal Cloud Foundry team constitutes the latest of high profile hires including Joshua McKenty, former CEO of Piston Cloud Computing and OpenStack co-founder and Andrew Clay Shafer, co-founder of Puppet Labs. The announcement of Black’s hire comes head on the heels of Pivotal’s decision to open source its Big Data Suite and enter into a strategic partnership with Hortonworks. Pivotal is a spinoff of EMC and VMware that aims to drive a transformation of contemporary IT by bringing the power of cloud computing, Big Data, agile application development and real-time analytics to the modern enterprise. The following represent Internet of Things Predictions from ParStream, the company behind the analytics platform built for the internet of things. 1. The Rise of the Chief-IoT-Officer: In the not too distant past, there was an emerging technology trend called “eBusiness”. Many CEO’s wanted to accelerate the adoption of eBusiness across various corporate functions, so they appointed a change leader often known as the “VP of eBusiness,” who partnered with functional leaders to help propagate and integrate eBusiness processes and technologies within legacy operations. IoT represents a similar transformational opportunity. As CEO’s start examining the implications of IoT for their business strategy, there will be a push to drive change and move forward faster. A new leader, called the Chief IoT Officer, will emerge as an internal champion to help corporate functions identify the possibilities and accelerate adoption of IoT on a wider scale. 2. Analytics Will Be the #1 Priority for IoT Initiatives: 2014 was about sensors and devices. The initial objective of many IoT projects was about simply placing sensors on critical assets such as aircraft engines, cell phone towers, cargo containers, and more to start collecting data from real-time events. Early IoT pilots demonstrated the wealth of information made possible by sensors and connections. 2015 will be about value. The attention will quickly shift from simply “enabling IoT” to truly “generating benefits from IoT”. Timely analytics is key in gaining actionable insights from data, and hence, a prerequisite for realizing the full potential of IoT. To drive more business value from IoT, companies will analyze more real-time data and implement new, innovative ways of delivering analytics to the “edge” or source of data. 3. IoT Platform to IoT Platform Integration Will Drive Relevance: Forrester recently proclaimed “IoT software platforms will become the rage in 2015”. Indeed, many IoT software companies are thinking “platform” rather than just “modules” to help deliver something closer to a “whole offer” for customers. However, an IoT platform’s real value will be driven by its integration with other IoT platforms. The reality is that there is no single, end-to-end IoT platform, which can deliver device management, data aggregation, analytics, visualization, etc. for the breadth of potential IoT use-cases. Hence, the power and value proposition of an IoT platform will be driven by its connection and integration with other complementary IoT platforms. 4. Industrial/Enterprise IoT Will Take Center Stage in the Media Spotlight: Driven by well-publicized acquisitions (e.g. Google/Nest) and high-profile new products (e.g. Fitbit, Apple Watch, etc. ), consumer IoT has received a disproportionate amount of media attention compared to industrial IoT. While consumer IoT will eventually be a huge market, the hype greatly outweighs the near-term reality with respect to adoption. However, the tide is turning and industrial IoT will take the spotlight in 2015 as the media starts to more frequently cover the massive opportunity and traction of enterprise IoT in driving efficiency and creating new business models (e.g. Harvard Business Review’s cover story on IoT in their November 2014 issue).